Compiled by: Mathaus N. Mbah. Series edited by: Roger M. Blench. The Moghamo language is spoken by over 100,000 people of the Batiobo Subdivision in the Momo Division of the North West Region of Cameroon. It is a dialect of the language Meta’, a Grassfields Bantu language (Narrow Grassfields), and categorised to the Niger-Congo languages. Moghamo has four different speech forms (Aywi (Batibo), Iyirikum, Ashong and Kugwe). Moghamo speakers are also found in some villages of Santu Subdivision, Banjah and Baforkum villages all in Mezam Division of the North West Region. 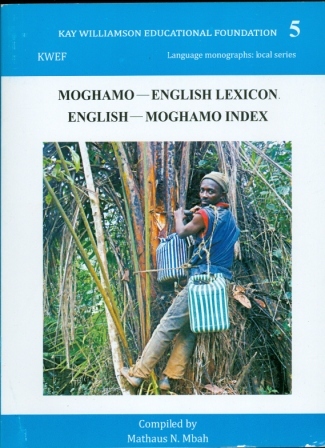 This provisional Moghamo-English and English-Moghamo lexicon has been compiled primarily for the speakers of Moghamo language, though it will also be of great interest to non-speakers willing to study or learn the language. Hopefully this lexicon will stimulate inter­est in the use of Maghomo language, both of adults and children, as they learn to read and write Moghamo. It will also serve as a repository of cultural terms and information, which may otherwise be lost as the language evolves and develops over time. Finally, this lexicon may be used as reference material in standardizing the spelling of Moghamo words and terminology. The Moghamo alphabet is in conformity with the General Alpha­bet of Cameroon Languages, which was adopted in 1979 by the National Committee for the Unification and Harmonization of the Alphabet of Cameroonian Languages. This lexicon comprises over 2,300 entries and is an introduction to the Moghamo words and phrases. The 1,800 SIL Comparative African Word List served as the­matic basis for the initial collection of words. Each lexical entry will include a phonetic transcription, part of speech and a meaning in English. Multiple meanings are numbered. Additional information such as: variant forms and plural forms of nouns may also be found. Most verbs are cited with the introductory infinitive particle ni. For example ni gho "to go" is entered as nigho v. to go. Under the following link you find another publication publishes by us, dealing with the language Metta.